Do you have students who struggle with participating in conversations with their peers or adults appropriately? I found some great materials that you are going to love. 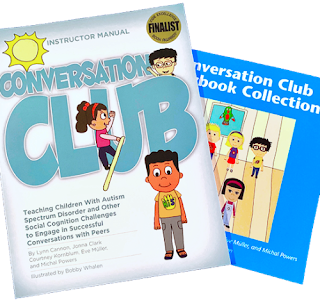 This curriculum is called Conversation Club and it's fantastic! First, it comes with data sheets!! These data sheets align with the curriculum and are very easy to use. There are lesson plans that go along with the student read-aloud book. Some of the activities are games that allow the students to further practice the skills they are learning with the read-aloud book. All materials that are needed with the activities are also provided. You just need to print and cut them out. I love the student read-aloud book. It's full color. The text both tells the story and asks students questions to get them thinking about the topic/skill they are working on. At the end of each section are club rules to help the students remember how to apply the skills they are working on.